We have just celebrated the arrival of the ‘Year of the Horse.’ In Chinese culture, the Horse symbolizes hard work, speed and strength. I wish all of these symbols support you with a successful and prosperous ‘Year of the Horse’! · As a result, the foundation of China-UK relations was consolidated. · Our economic cooperation made remarkable achievements. · Last year China-UK bilateral trade for the first time passed 70 billion US dollars. 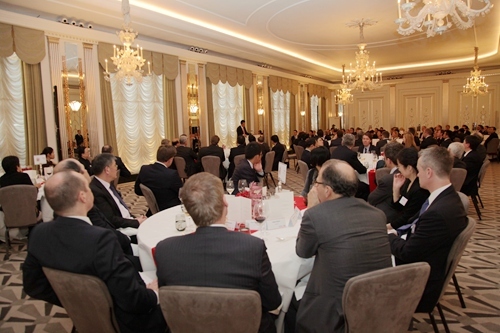 · Chinese investments in Britain added up to more than 5 billion US dollars. · China and Britain signed a currency swap agreement worth 200 billion yuan. · This was the first of its kind between China and a major developed economy. · London was granted a RQFII quota of 80 billion yuan. This also created a record outside Asia. · The Shanghai Pudong Development Bank opened a representative office in London. · The license for branches of Chinese banks in London moved high on the agenda of the two governments. · China’s Industrial and Commercial Bank issued 2 billion yuan RMB bonds in London. · HSBC was both a champion and an active player in making London a centre of off-shore RMB business. I am delighted that this initiative is making steady progress. 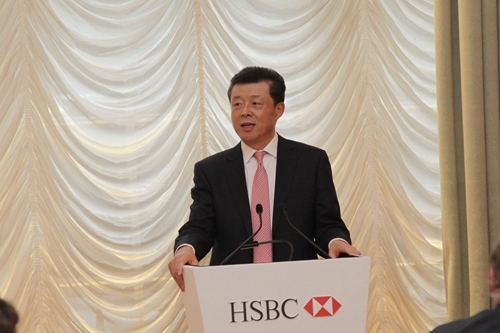 · Last year HSBC Group invested another 3 billion yuan in HSBC China. · That showed just how much HSBC sets store by the Chinese market and its high expectations of its business in China. · With 21 newly opened outlets across China, HSBC continued to have the largest number of outlets and the widest geographic reach of any foreign bank in China. · Also in 2013, HSBC was awarded Best Foreign Retail Bank in China, Best Commercial Bank in China and Best Sub-Custodian Bank in China. I warmly congratulate HSBC for your stunning success in China. · At the same time, HSBC’s commitment to China’s environmental protection and charity programs was impressive. Its accumulative donations in such causes have exceeded 500 million yuan. Last year, for the eighth consecutive year, HSBC was given the China Business Charity Award by the Chinese Ministry of Civil Affairs. I salute HSBC for its strong sense of corporate social responsibility. In 2014 China will comprehensively deepen reform. To be specific, China will deepen economic reform, improve the system of modern market economy and further open its economy. China will shift its growth model. It will more pro-actively integrate with the world and explore new means and models for opening up. The year 2014 marks the 10th anniversary of China-UK Comprehensive Strategic Partnership. Our two countries are committed to co-operation based on mutual respect and mutual benefit. We are also committed to a partnership for growth. I have no doubt that in 2014 China-UK relations will be more splendid. China-UK cooperation will be more fruitful. Today, the 12th of February happens to be the birthday of the great scientist Charles Darwin. He is among the Englishmen best known to the Chinese people. He is famous in China and around the world for his theory of survival of the fittest. It is a law of nature. It is also a law in business. The Chinese market is highly open now. It is therefore full of competition as well as full of opportunities. I hope British companies will seize the opportunities and actively explore the Chinese market. There are immense gains for British business in China. But, to win the prizes it need to improve investment layout, make greater efforts in R and D and extend industrial chains. I hope British business in China will not only survive, but also thrive! I also hope that HSBC will adapt its advantages and expertise to the Chinese market and continue to be a ‘leading horse’ in China-UK financial cooperation. In conclusion, I once again wish you a happy and successful ‘Year of the Horse’!